Posted on May 12, 2014	by Katy K.
It’s Children’s Book Week, and once again, I’m proud to be participating in the Kidlit Giveaway Hop hosted by Mother Daughter Books and Youth Literature Reviews. Participants will be giving away books for children and teens, gift cards, cash and more, so hop around and you’re sure to find something interesting to enter to win! I am giving away two early chapter books in the Sam Silver: Undercover Pirate series by Jan Burchett. & Sara Vogler, Kidnapped and The Deadly Trap to one lucky winner. These were previously released in the U.K. and have been published for the first time in the U.S. this year. 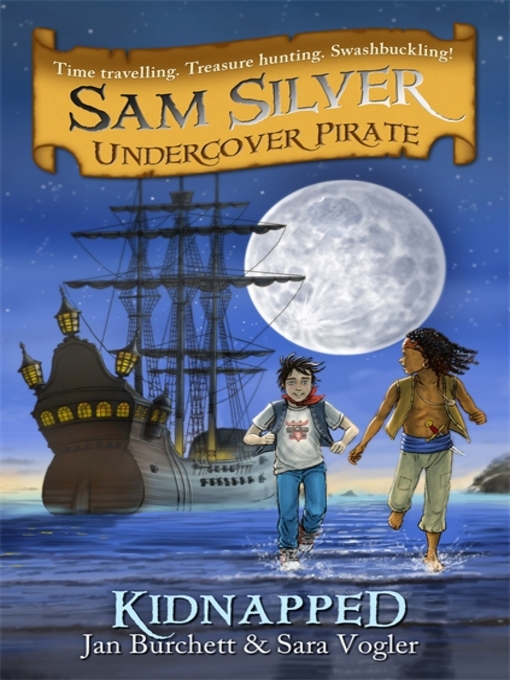 This fun series stars a modern-day boy who finds a way to travel back in time to a pirate ship. Together with his best friends, a girl in disguise and a boy of African-Caribbean descent, they have one swashbuckling adventure after another. I was sent these two books for review by the publisher. My son read both of them through, when he’s rarely interested in reading more than one book of a series to himself. 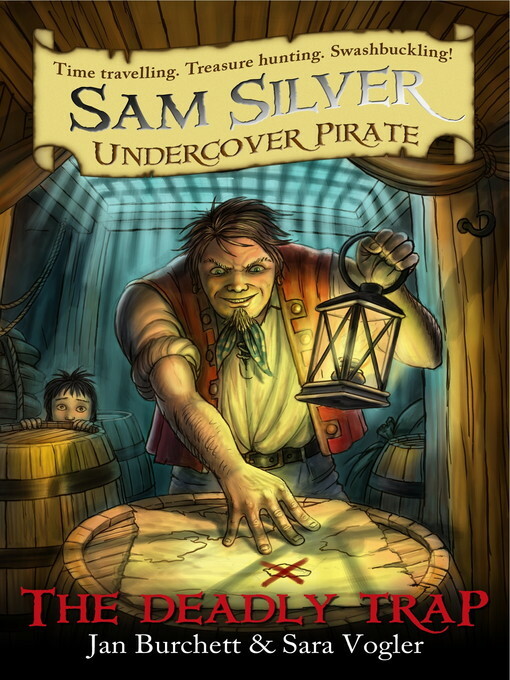 Since my library has now purchased the entire series (and with my son’s permission), I’m giving away our copies so that some other pirate-loving kid can enjoy Sam Silver and his friends! This giveaway runs from May 12- midnight May 18 (EST) and is open to the U.S. and Canada. Please leave a comment about your favorite pirate, literary or otherwise, to enter! Are you a children’s book or teen literature blogger, an author, a publisher, or a publicist looking to share copies of a fabulous book? Mother Daughter Book Reviews and Youth Literature Reviews are joining forces to provide you with the opportunity to take part in the Children’s Book Week Giveaway Hop 2014, featuring links to giveaways for fabulous children/teen’s books, gift cards, cash, or other prizes. What better way to celebrate Children’s Book Week? This entry was posted in Books and tagged Early Chapter Books, giveaways, Kid Lit Giveaway Hop, pirates. Bookmark the permalink. Hi there, just wanted to say the books you’ve shared here look and sound great. I would’ve entered the giveaway if I live in the U.S.. Still, Happy Children’s Book Week, and it’s a pleasure following you! Thanks so much, Claudine, and I’m sorry not to make them available to you. Happy Children’s Book Week to you, too! Wow! I knew Black Beard was bloody, but I had no idea he was that ruthless towards his wives, too! One of my sons has decided Bluebeard is his favorite. Was there ever a Bluebeard? I think Bluebeard is the scary wife-murdering guy from the fairy tale by that name… but I’ve seen kid’s books give pirates all sorts of colored-beard names, because of Blackbeard. Captain Hook made me tremble in my pants when I was a girl! Now a days I know better. Thanks for the opportunity! You’re welcome! I was terrified of Captain Hook as a child, too! Wow I don’t think I have ever really thought about a favorite Pirate… I guess I would have to say Hook! Think I will add some pirate books to our list for today’s library trip! Captain Hook is a good one! Pirates have been favorites at my house for a while… if you click my pirates tag on the side, you’ll find pirate books for all ages! we own and love pirates don’t change diapers! Yay!!! We love both Pirates Don’t Change Diapers and How I Became a Pirate. My boys love pirates and they would love to read these books. I do love series as I think they help to encourage reading more. Please share who their favorite pirate(s) is/are! I’d love to hear – and series are great for encouraging reading. My boys loved Peter Pan, so I’m going to have to go with Captain Hook. Captain Hook certainly seems to be the Pirate King this go-round! Well now, this is an easy question! Not only is Captain Jack Sparrow my favorite pirate, he’s one of my favorite characters ever. 🙂 That, and a historical fiction novel I wrote, led me to research historical pirates, giving me many other favorites…like Calico Jack Rackham, nicknamed for his strange clothing; Bartholemew Roberts, a teetotaller who made his crew attend prayer services; and Anne Bonny and Mary Read, the only-known female pirates in the Caribbean! Captain Jack is fun – but I’m also a big fan of Anne Bonny and Mary Read. (and love the shout-out in “Pirates Don’t Change Diapers” of the baby being named Bonny Anne. Cursed Pirate Girl is one that my 8 year old daughter liked so much that she asked to talk to the head of the library in an attempt to get the library to purchase the sequels (so that she and other kids can enjoy them). Her favorite real pirate is Madam Ching – the most successful pirate in the world – ever (and she loves that the most successful was a girl!). Hooray for Cursed Pirate Girl! And do you know of books about Madam Ching for kids? I’ve only met her in the Jacky Faber books, too old yet for R.
I think Jack Sparrow is shaping up to be the second most popular pirate in this poll! I don’t know of many pirates, and none personally 😉 , but I am definitely a fan of Jack Sparrow. I find it hard not to be a fan of Jack Sparrow. Thanks, Julie! Of course I remember that you’re in OZ – I’m so sorry I’m not able to offer these internationally. Pirates hmmmm let me see, how about Captain Hook! Yes, Captain Hook is the one that I will choose for this entry. But, I must say Tinkerbell is my real favorite buzzing character. lol I just hate to say that a pirate is someone that I favor! But cheers to you for helping to promote literacy! Well… it is funny how much I enjoy pirates, when I’m generally opposed to violence and robbery! But my daughter would agree with you on liking Tinkerbell. That’s a very good lesson from Captain Hook! My favorite pirate is Blackbeard. Growing up on the coast of NC, I learned a lot about him. Yay, Blackbeard! It’s fun to hear that you grew up hearing about him. Thank you! I think Jack Sparrow might start to overtake Cap’n Hook. Looks like these pirate adventures will be real attention grabbers for readers. They certainly worked for my boy! And please share your (or your kids’) favorite pirate to enter the giveaway! Haha! That’s a fun and understandable favorite group of pirates! Thanks – and I really want to read about those pirates myself! Three cheers for Captain Jack! I wouldn’t want to meet Bluebeard, either. Thanks so much for hosting, Renee, and for all your promotion efforts! My favorite Pirate is Black Beard. Thanks, Veronica! Vote #2 for him. Thanks, Jenny! About to tally the votes and see whether Captain Hook or Captain Jack Sparrow is Pirate King.